We all need a brain break from time to time. There are days where you feel like things are moving way too fast for you to keep up and your scattered thoughts and to-do lists can’t be wrangled into something manageable. 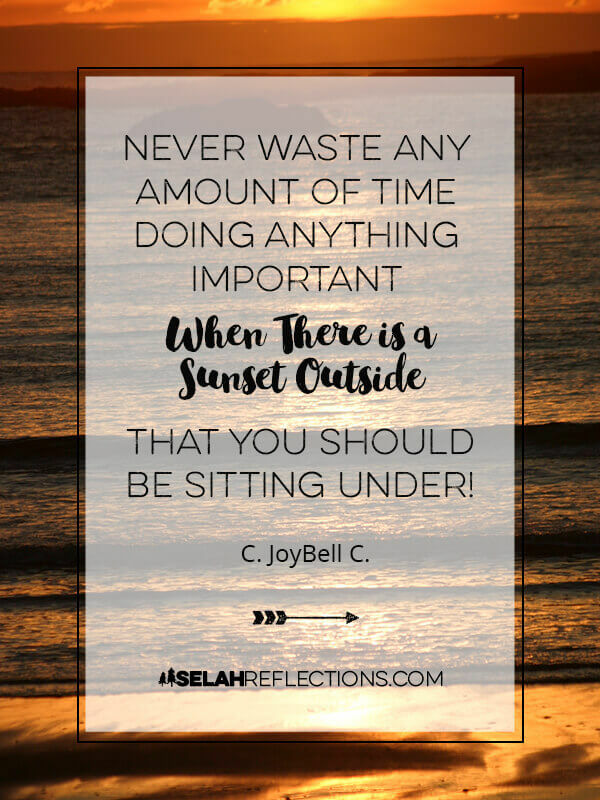 At times like this, we need to make the intentional decision to slow down and engage our hearts and minds in something outside of our normal routines. 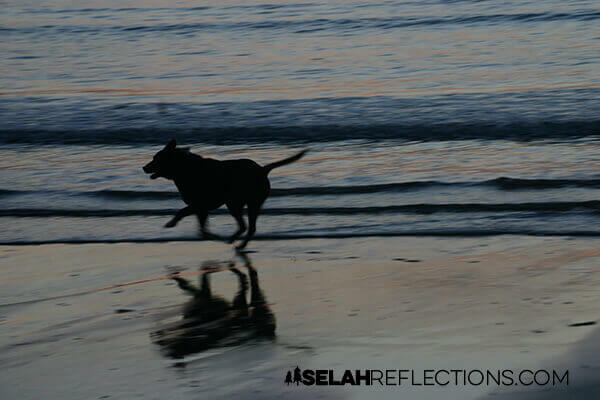 For me that break usually includes going outside, my dog, and my camera. In fact, spending time outside, in nature, is one of my non-negotiables. 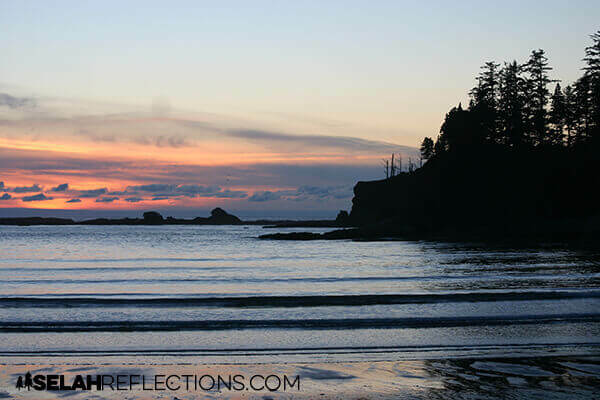 Recently I made the decision to give myself a break and chose one of the most beautiful locations along the Oregon Coast, Sunset Bay. And with a name like that, you can safely bet that I went at sunset. It’s a beautiful place to sit, be still, forget the to-do list, and just be. When you go out to watch a sunset, make sure you get there at least a half hour (if not earlier) before. And just like the end of a Marvel movie, make sure you don’t leave too soon. Even after the sun has dipped below the horizon, the light show doesn’t end. Every few minutes (even seconds sometimes) the colors change, and clouds move and reflect the light at different angles. Your signals may be different from this list. Sometimes the hardest part is recognizing the fact we need a break instead of pushing our way through. Turn off electronics. Especially your phone. When you are so busy and feel like you can’t take a break, is probably the time you need one the most. 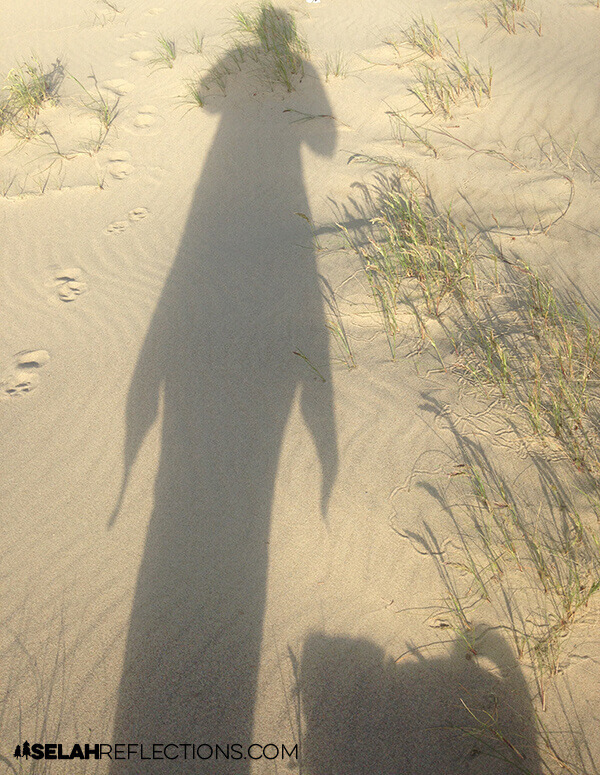 As usual, summer is flying by. 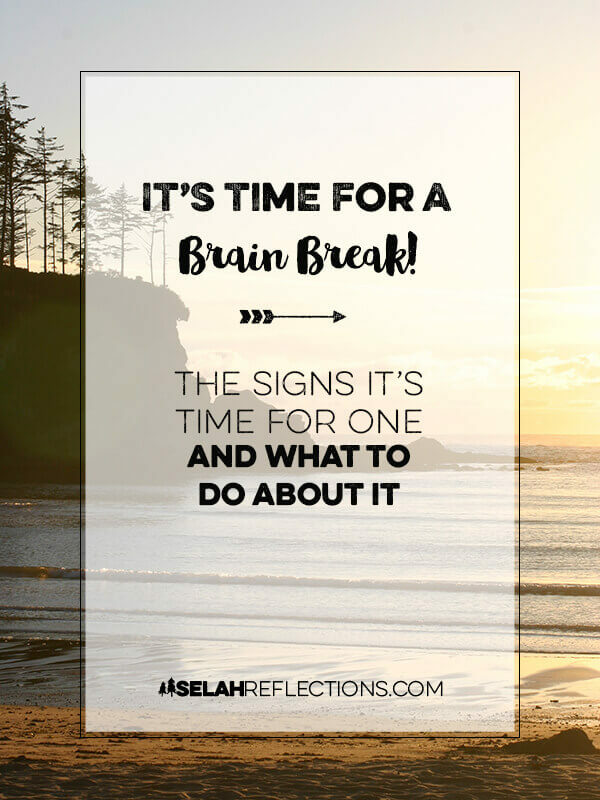 So make regular, intentional decisions to stop, slow down, and give yourself the gift of a brain break. What is your favorite way to take a break? What a year of change this has been for many of the people I know. One of adjusting expectations, plans, and goals in many areas of life and I am no exception. My slow recovery from surgery back in February and trying to get back to “normal,” or at least what I think normal should be, has at times left me frustrated and struggling to adapt. I’ve come to the slow realization that my life has changed and how I used to operate before getting sick will not work now. It’s time to find a different way of doing things from my business, self-care, and caregiving. These are not necessarily bad changes, but they have left me scrambling to keep up, find a new rhythm, and new routines that not only work but also keep me on the path of healing. 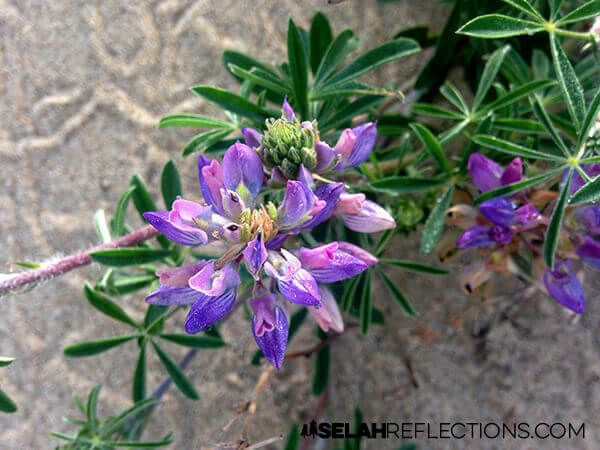 Lately, the journey of finding stillness has been an inward one. Looking at all the mental clutter, I’ve accumulated that has at times left me unsure of what the next priority is. I’ve always been a collector. It started when I was still in grade school. With my allowance, I would go to the bookstore to buy a Nancy Drew book to add to my collection, a bookmark, and sometimes a handful of stickers. Recently, however, I’ve discovered just how far that collecting has gotten me and in some ways has become a burden. The idea of collecting started out innocent enough but has now morphed from physical collections to mental collections of ideas. Lots, and lots of ideas. More ideas than I will ever be able to pursue. In the information age, ideas are everywhere. We can learn quickly and easily simply by asking Google a question, and all sorts of answers magically appear. The problem (for me at least) is that with all this information at our fingertips we find one new idea leads to another, and soon we discover that learning is fun and exciting. Often it is more appealing to keep learning new things rather than going out and applying what we’ve learned. With all these ideas and opportunities to learn it can keep the brain crowded and cluttered. The result is a heightened sense of anxiety and stress. We see all the things we have learned, and haven’t used. All the things we still want to learn and try. All the ideas we have applied that didn’t work so now need to tweak or move on to the next idea. No wonder we have trouble finding the off switch at the end of the day. In a previous post, I talked about the power of carefully considering what you say yes to and more importantly what to say no to. Understanding the impact of these choices continues to change the way I think about my business, my goals, and my daily to-do lists. 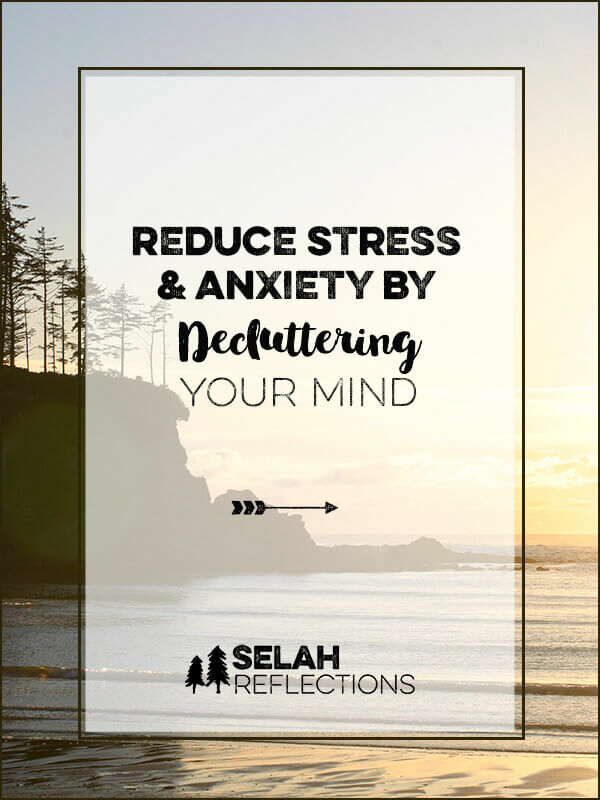 In fact, it has even helped me start working on decluttering and reducing stress in my life. Here is a short list of a few of the steps I’ve been taking. This is an example of choosing my yes and no carefully and has helped me reduce the number of podcasts I subscribe and listen too. I’ve also gone through and unsubscribed from many of the different newsletters, blogs, and websites I follow. I’m also removing myself from countless Facebook groups and pages that I seem to have collected over the years. This one step has already made a significant impact on my email inbox by reducing both the volume of email I receive and the distraction of so many voices and opinions. This one has been super hard for me. But applying the principle that if I say yes to 10 projects at once, I’m saying no to getting any of them done in a reasonable amount of time, if at all. Picking my yes carefully, and understanding why I said yes, has helped me navigate through my list of projects and prioritize them. You should see my monthly and weekly project tracking sheets. They are a mess as I re-write them mid month and make them shorter and more focused. Taking this step has given me confidence that I can complete more projects and reach my goals. For some reason, this acronym finally hit home. 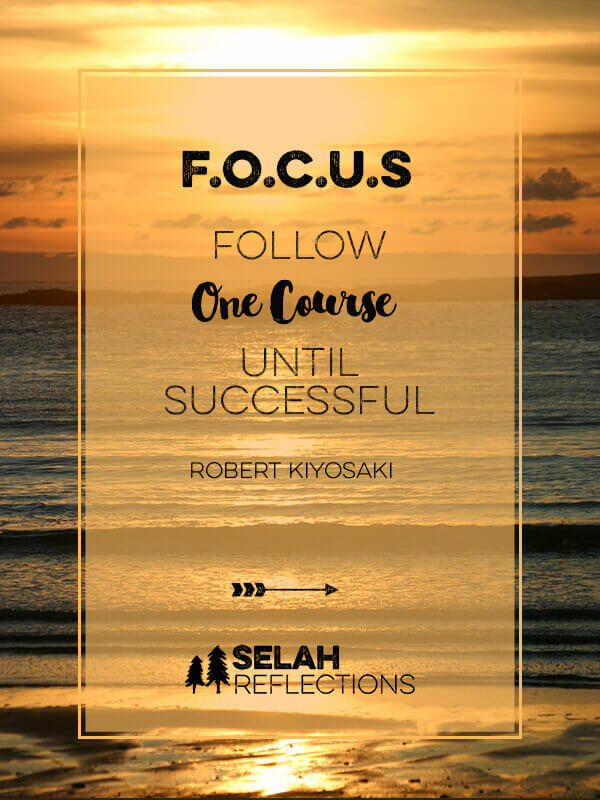 Coined by Robert Kiyosaki and shared in a blog post by Shelley Hitz, this advice is making one of the biggest impacts in my efforts to declutter my mind and my to-do-lists. Sounds simple enough right?! But for someone who loves ideas and research has been incredibly hard. It’s a concept that I have to revisit daily. I should point out here, that I will always have a side-hustle or project, always, I know myself too well. I need variety in my projects and tasks to keep me engaged; I get bored way too easily when focused on one task or project for an extended period. But, having a big goal as my primary focus and only 1-2 minor goals/projects to work on instead of 10? Well, that is progress, and my goal tracker is showing more completion marks than it has in a long time. One benefit of the changes I’ve been making has been a slight reduction of stress and anxiety. It has become so routine to feel the need to tackle “all-the-things” that I didn’t even realize it was there. Now that I have some of the priorities figured out, a plan that feels doable, is still varied (essential for me! ), and does not ask me to try to do “all-the-things” right now, has cleared up a lot of mental clutter that has accumulated over the years. I’m learning to release the projects that do not fit right now to a someday/maybe list, and I’m doing a better job of prioritizing what needs to be done now versus later. Instead of being in the middle of 3 or 4 books and magazines, I’m only allowing myself one book and one magazine at a time. The rest are put back on the bookshelf. I’m starting to finish books and magazines in a reasonable amount of time. What a concept! Instead of being in the middle of several Bible study plans that I don’t always finish. I’ve simplified my routine, and I love it. I’m getting so much more out of my devotional time, and I know I will stay with it and not get distracted by something new. A picture of God’s creation to enjoy. 1-2 verses to write out each day. A list of 3-5 things I am grateful for. A place to write down things that come to mind that you don’t want to forget. Each day you will also receive an email with additional thoughts on finding stillness in your life. You can read more about it here or by entering your name and email address below. When we learn to pick and choose what we say yes to and no to, in alignment with our priorities, life doesn’t necessarily get simpler. In fact, in some ways, it gets harder. To carefully pick your yeses and no’s you will have to turn down invitations from friends and great opportunities to keep what is important front and center. As I learn to choose my yes’s and no’s, I’ve been able to say yes more to my priority of spending time outdoors. Being in nature is my way of destressing, slowing down, and breathing deeply. 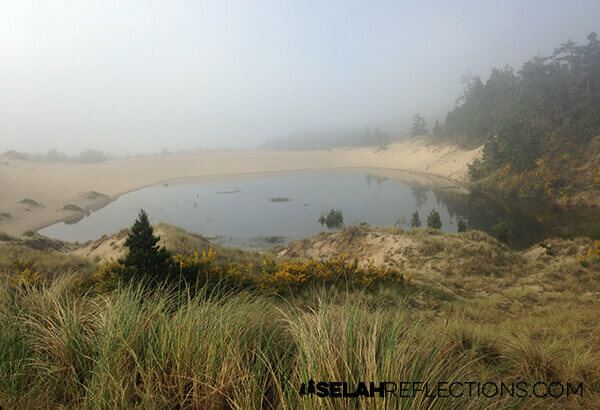 I’m blessed where I am to be able to get to the Oregon Dunes, lakes with miles of trails, and to the beach all within 10-20 minutes. And on the days where the weather isn’t pouring down rain, and I have the energy to go, it’s the perfect time to grab Bailey, jump in the car and head out on an adventure. Having adventures gets in one’s blood, and Wanderlust can strike at unexpected times. 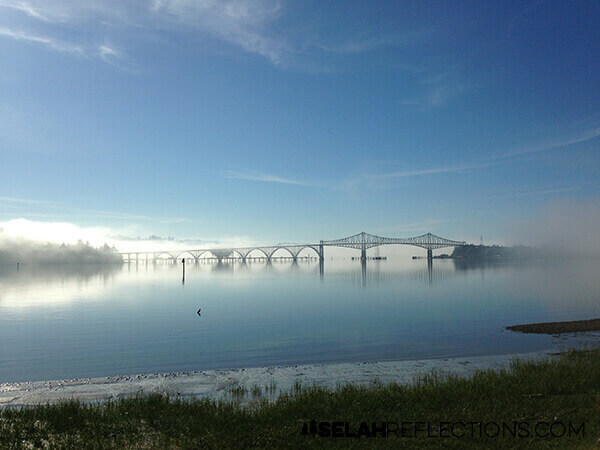 There is a longing to see or do something new like taking a trip, a desire to explore a road you drive by all the time but have never been on before, or taking a hike to a favorite, little-known spot. 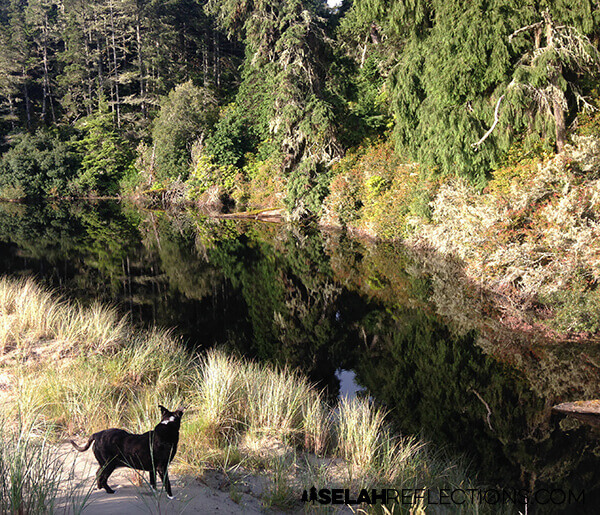 Other times it is taking an extra long walk, exploring different parts of a trail or wilderness area, or as on this day, a different part of the Oregon Dunes. This month I had an extra “partner-in-crime” my Mom’s lil’ guy, Oliver. A 12lb Chihuahua Beagle who at times has waaaaaay more energy than my 65 lb Border Collie mix. So taking him on adventures adds a new spin and careful consideration that he 1) doesn’t get lost and 2) can walk as far as we want to walk. I like to call it “Taking Oliver Off-roading” as this is not something in his routine, so taking him out onto the dunes was an adventure for him as well. Outdoor adventures do not have to be complicated or in faraway places. They can be in your local area, and in my case only about 15-minutes away. The dunes in this area are not extensive, but there are lakes, creatures of all sorts, brush, trees, and flowers in the spring and summer. All of it beautiful in its own unique and special way. As you take time for adventures, don’t forget to look up, down, and all around. It’s so easy to keep your head down watching where you place your feet, which of course is important, but when we don’t take the time to look around, we miss out on so much. 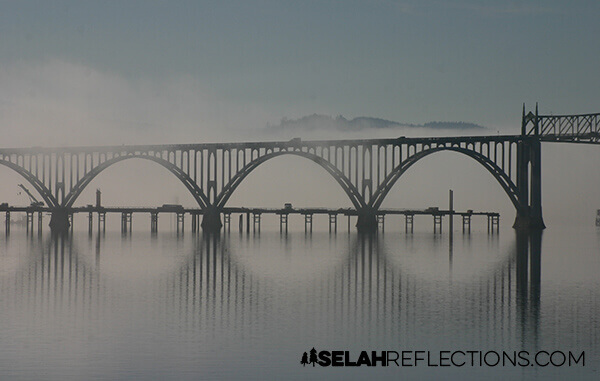 On the drive home from this adventure, I would have missed a magical sight if I had not taken the time to look up and then take the time to stop and view the bridge as it was starting to break through the low hanging fog. It was one of those adventures you look back on with fondness and can’t wait to go out and try it again. Well at least until you find the tick your dog brought back home! That discovery resulted in a thorough head-to-toe examination of both dogs to their great delight. 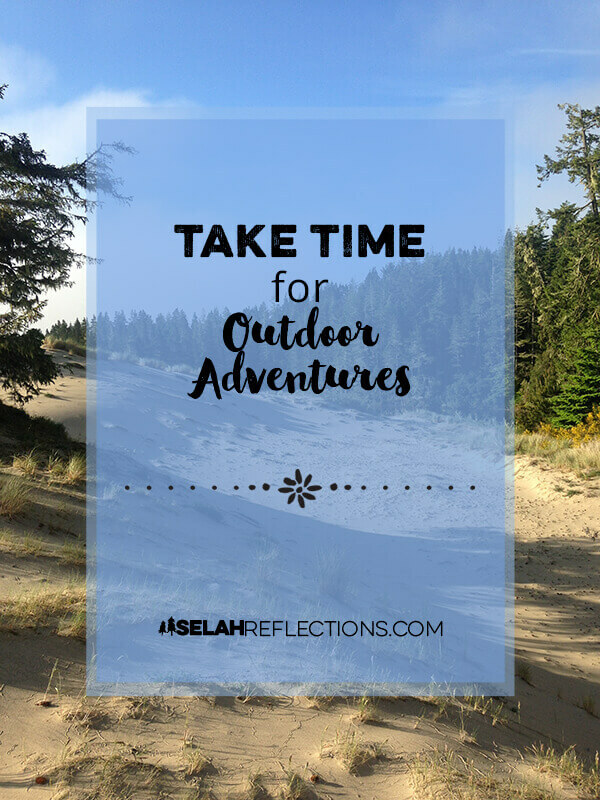 When is the last time you took time for an outdoor adventure? A fun mug to remind you to get outside and explore on your next adventure. From our family’s Amazon store 🙂 Click on the mug for more info. When is the last time you remember sitting in silence? Is it even possible in today’s world? Clock ticking, refrigerator humming, house creaking, birds chirruping, cars in the distance, and planes flying overhead noise is everywhere even if we are not always conscious of it. How do you feel in silence? Do you enjoy it or do you feel uncomfortable? We often wish for a few minutes to simply sit and be. But, when we do finally get those few minutes what do we do? We turn on music or grab our phones to check texts, Facebook, Pinterest, or Instagram. We wish for silence, but then we fill it. This question asked in a podcast that I listened to recently, and I had to think about it for awhile. I’ve struggled with Tinnitus for years now. It’s an annoying ringing in the ears, that drives me crazy at times. There are times it interferes with my ability to focus or get to sleep. To help mask the ringing, I usually have some form of background noise running, like soft music, a fan running, or a great app on my phone called Noisli. Because of that, silence for me may have a slightly different meaning than for you. As I thought about this question, however, I realized the answer is yes, there are times I’m afraid of silence. Add in feelings of overwhelm and stress, and that fear escalates. I think of external noise like loud music playing, video games running, TV, children playing, running, or arguing, road construction. While some may thrive in these environments, others do not and may feel overstimulated and stressed. Oh, the joys of a brain that doesn’t stop talking. It also chatters, blames, and tries to keep that one thing you are trying not to forget in the forefront of your mind. Sometimes I think the internal noise is louder than external. Why Are We Afraid of Silence? 1) We are addicted to being in motion and taking action. Slowing down and experiencing a few minutes of silence can be a shock to the system. Our minds continue to run through our never-ending to-do-list. It sometimes screams at us that we are lazy, and not doing the important things. 2) We are afraid of our own thoughts. If we slow down long enough to catch our breath and allow our body to catch up with our brain, we may not like what we discover. Knowing these kinds of thoughts will assault us if we sit in silence, it’s no wonder we run away from it! We all know that silence can feel deafening. Isn’t that a strange feeling? That the absence of noise can seem loud? In today’s culture we don’t experience silence often so it can feel unnatural and odd, but experiencing silence is healthy and healing. Learning to slow down racing thoughts helps us relax, rest, sleep better, and cut through the noise and focus on what is important. I’ve started a new habit of making having a notebook and pen on my bedside table so I can jot down things I’m trying to remember. That way I’m not struggling not to forget and keep myself awake at night. It’s also a good time to jot down a short list of things I’m grateful for and end my day on a positive note. 2) Silence helps us be present. 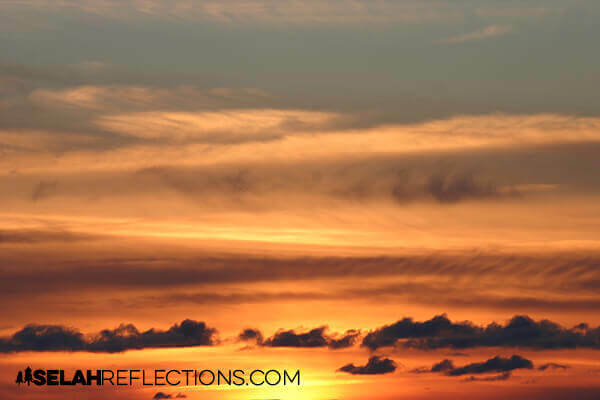 By taking a moment be still, we bring our thoughts away from the future and into the here and now. When we do that we can see what is important here and now like relationships, family, faith, and health. 3) Silence helps us hear better. God rarely speaks in loud tones demanding our attention. He tends to speak softly, patiently waiting for us to hear. But we are usually surrounded by such loud internal and external noise we do not hear His leading and prompting. Sitting in silence with His word in our hands gives us the opportunity to hear better and trains us to listen. It also helps us hear the needs of others better. It might be a child asking you to play or hearing the unspoken hurt in a friend that needs your understanding or listening ear. Learning to be silent helps us here these requests. This week pay attention to those moments of silence, while standing in the grocery line, sitting in the car waiting to pick up the kids from school, or when you head to the bathroom. What is your first instinct? I bet many times it is to pick up your phone and see what is going on or what you may have missed. Learning to be silent will not happen overnight, no new habit will. It will take time, patience, consistency and a willingness to be uncomfortable with the silence and not try to fill the space. How can you practice sitting in silence this week? At the end of each year, it seems everyone is talking about making New Year’s resolutions, setting goals, and giving tips on how to make it all happen. Picking a word of the year should be different. It’s easy to get caught up in the excitement. So we start making plans and dreaming about what we would like to accomplish in the coming months. Sadly, however, research tells us (especially gym owners!) that most of us will give up on our New Year’s resolutions by January 15th. We lose interest, get busy, and get discouraged. It’s a question I’ve been wrestling with again this year as I pick my word for the year. How do I stay motivated and focused once the excitement has worn off and the hard work begins? 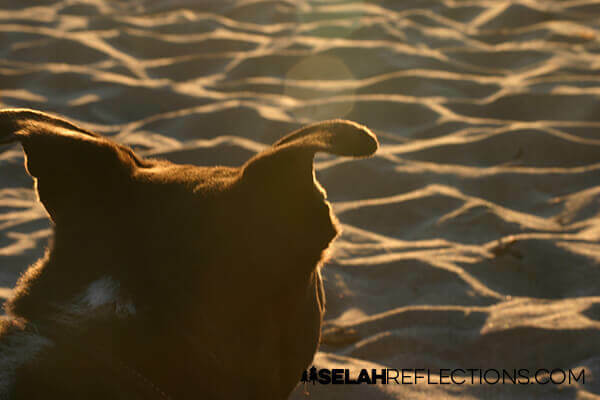 As I have worked on my overall vision for this year and what things I want to accomplish in my health, relationships, spiritual walk, and in my business, the word Purposeful kept coming up. So I adopted the word again for this year. Last year I wrote about the four lessons learned in picking a New Year’s word. Thankfully in looking back at that post, I see that those lessons still apply. This year I thought it would be a good idea to expand the list with a few more lessons learned. This one comes courtesy of Lara Casey of CultivateWhatMatters.com. The past six months has held some pretty significant hurdles including finding (and buying) a small fixer upper for Bailey and me followed by some health issues that have slowed both me, and the renovation schedule way done. 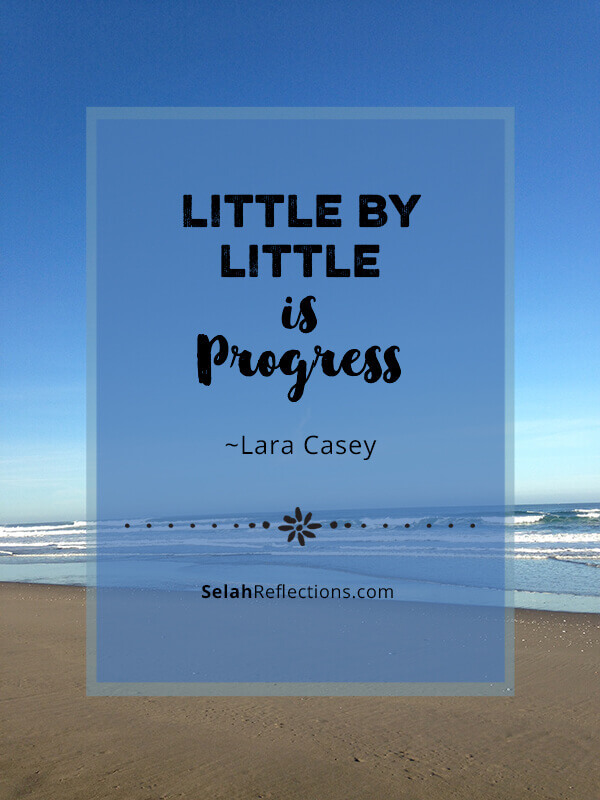 On the days I’m frustrated, tired, and wonder what in the world I’m doing, Lara’s concept of “Little by Little Is Progress” comes to mind. So I pick a small task to tackle that will help keep my goals and projects moving forward. Some days this means taking 10 minutes to fill in the holes in the wall and be one step closer to painting it. Or maybe it is brainstorming a short list of blog post ideas. No matter what you pick, the point is to take action, at lease one small step that will keep you moving forward. It’s hard to remember sometimes, but, small daily actions build up over time to produce significant results. Lesson #5: Release Your Unrealistic Expectations. It is so easy to get caught up in the fervor of starting the year with a blank slate. We get caught up in grandiose plans and expect to see giant leaps and bounds of progress right away. No wonder we fizzle out! We expect so much from ourselves and get incredibly unrealistic in what we can accomplish during the day, week or month. As a result, New Year’s resolutions become burdens. 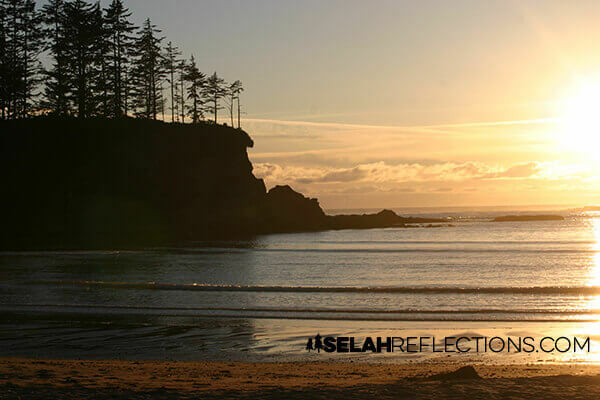 Each year it becomes more apparent that I need to look closer at the expectations I place on myself. And now with the health issues that have sprung up, I need to be more aware than ever before, of how I manage my time and energy. These limitations force me to get real about the unrealistic expectations I tend to place on my schedule. Well, most of the time anyway, I’m still working on this one. When the overwhelm hits, and it feels like I’m not making as much progress as I had hoped, it’s time to remember that picking a New Year’s word is about a journey. Not everything has to be completed by some arbitrary date that is entirely unrealistic. 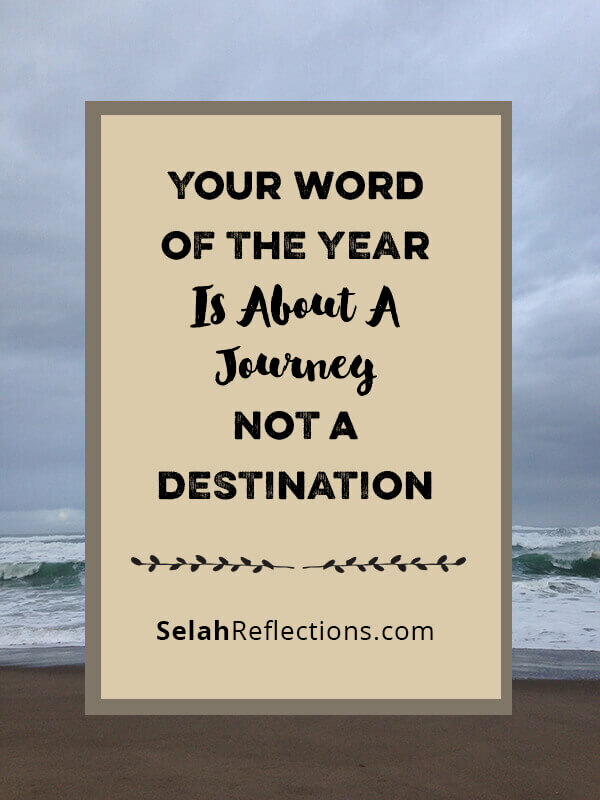 The word we pick for the year describes a journey. This one word can help us make daily purposeful decisions that keep us moving forward, even when the going gets tough. It’s about knowing that some days will work the way we planned and giving ourselves grace on the days that don’t. Do you pick a Word of the Year? Share yours in the comments below.